This is a book many poets, and indeed most other readers, would appreciate. It is beautifully edited and presented in cloth-bound edition by Dr Rosie Bailey and June Hall, and includes work by nearly two hundred poets, including U.A. Fanthorpe, Andrew Motion, Carol Ann Duffy, Jackie Kay and Wendy Cope, and has a foreword by Maureen Lipman. It includes work by Fountain poets Rosalie Challis, Claire Coleman and Rachael Clyne. 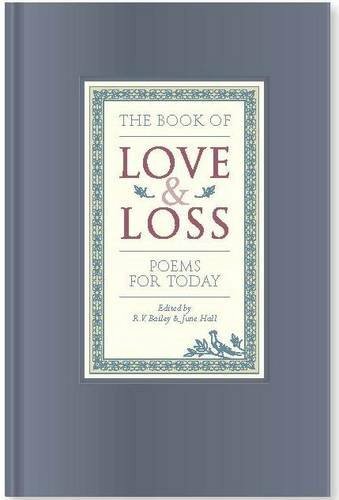 The Book of Love and Loss could become a classic resource for anyone seeking comfort through poetry. It covers many aspects of loss: the poignant, the humorous, the practical, spiritual and stark. It is dedicated to the memory of U.A. Fanthorpe and all proceeds go to the Parkinson’s Foundation. This entry was posted in Books received, poetry and tagged Andrew Motion, Carol Ann Duffy, Claire Coleman, Dr Rosie bailey, Jackie Kay, June Hall, Maureen Lipman, Poems of bereavement, Rachael Clyne, Rosalie Challis, U.A. Fanthorpe, Wendy Cope on November 21, 2014 by barleybooks.